Acceptance of reservations is at the sole discretion of Coastal Waves Vacations. Guest must be 25 years of age or older to rent, may not rent on someone else`s behalf, be the responsible party, must occupy the property during entire reservation period, be the one to sign the rental agreement, and not participate in any illegal activity. Only this person is allowed to check-in. 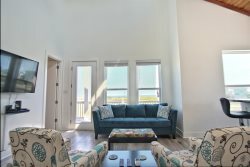 Upon acceptance of the reservation, a rental agreemetnt is emailed which MUST be completed by both guest and Coastal Waves Vacations before any check-in information can be emailed or access granted to the property. Some communities require IDs of all the adults staying at property. The Rental Agreement requires Guest's mailing address, names and ages of all individual staying at the home, vehicle information, and full pet information (for pet friendly properties). Only up to 2 dogs are allowed at pet friendly homes with prior approval of at sole discretion of Coastal Waves Vacations, and additional fee. No prom, graduation, events, or parties of any sort without prior approval and additional cost. Approval is at sole discretion of Coastal Waves Vacations. Our homes are in residential communities; parking is limited; maximum of 2 vehicles at condos and 4 at homes. RVs, trailers, or large commercial vehicles are prohibited. Parking limited to designated guest parking spaces. No commercial photography or filming is permitted at any property. If guests are found violating the rental agreement guests may be asked to leave with no refunds or rebates. Guests evicted requiring law enforcement assistance forfeit the security deposit is forfeited and additional fees may apply. Due to local laws, regulations, or Homeowner Association rules, guests may be required to agree to additional terms of service. Any reservation obtained under false pretense will be subject to forfeiture of advance payment, deposit and/or rental money. CANCELLATION POLICY: All cancellations must be received in writing to Coastal Waves Vacations. Changing Agreement Holder, Property, or reducing the length of stay from the original dates invokes the cancellation policy. Cancellation of the arrangement due to non-payment of the balance by the due date will result in the forfeiture of your entire payment. Reservations made on the third-party travel sites such as but not limited to HomeAway, TripAdvisor, etc. follow the cancellation policy posted on party’s reservation site. Cancellation within 30 days of arrival results in the forfeiture of your entire payment. Cancellations within 90-31 days prior to the Arrival Date will receive a refund minus 25% of total rental rate, minus the non-refundable processing/administrative fees plus tax and minus any travel and SDW. Cancellations outside of 91 days prior to the Arrival Date will receive a refund minus 10% of total rental rate, minus the non-refundable processing/administrative fees plus tax and minus any travel and SDW. CWV regrets that they are unable to waive any of the cancellation charges above, whatever the circumstances. NO EXCEPTIONS!